Shown here are the seven components of the smoker's set. Seen here is the tobacco jar with molded lion's head handles. 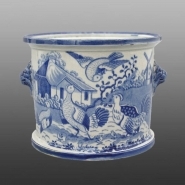 A very rare smoker's set printed in blue in a pattern featuring a menacing hawk in flight above a rooster and two hens set in a domestic landscape with a windmill in the background. The central pattern is framed with a floral design. The set consists of seven pieces; a candle stick, goblet, ashtray, plate (also serving as a stand when inverted), tobacco jar, press, and snuff box. These sets were sometimes referred to as the "Bargee's Companion." 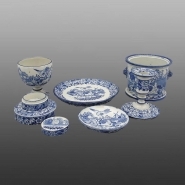 It is uncommon to find a complete set that has survived for nearly 200 years. Shown below are all of the components separated.